Commissioned by Wicklow County Council under the Per Cent for Art Scheme and on behalf of Music Generation Wicklow, Mostly Me is the result of Elaine Agnew’s work with first and second classes from St Brigid’s National School, Greystones; Newtownmountkennedy National School and St Laurence O’Toole National School, Roundwood. 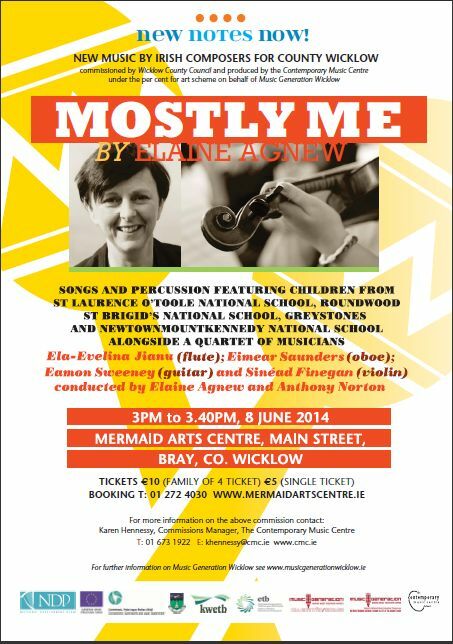 The piece premiered in the Mermaid Arts Centre, Bray on 8 June 2014 is a composition of songs and percussion for children aged between 6 and 8 years. Elaine Agnew carried out 3 workshops in each school as part of the project. Working with the Music Generation Wicklow tutors the children were actively involved in the writing of the piece, in particular in the writing of words for the numerous songs it contains. At the end of the process a book of worksheets will be compiled by Elaine for rolling out across the Foundation Music Programme. 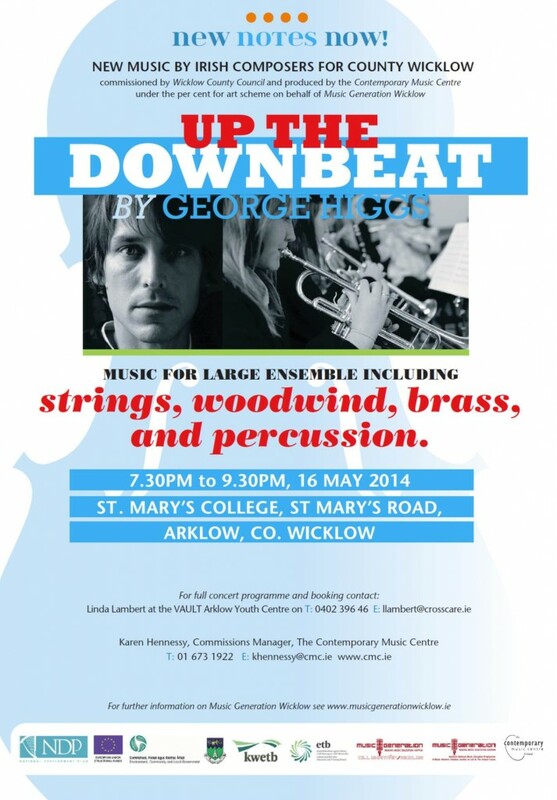 The 12-minute work, Up the Downbeat, is a commission from Wicklow County Council on behalf of Music Generation Wicklow for large ensemble including strings, woodwind, brass, and percussion. The musicians for the piece included 14 young people from the VAULT Arklow Youth Centre and 15 members of the St Mary’s College orchestra, Arklow, under the direction of Christine Steele. The performance took place in St Mary’s College on 16 May 2014 as part of the ‘Arklow Youth Music Project’ – a showcase of the diverse musical talents of young people in Arklow hosted by the VAULT. 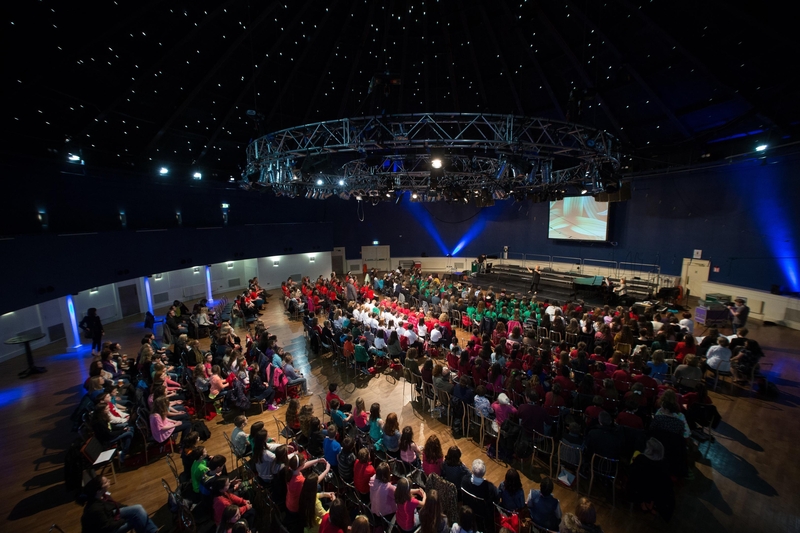 Sunday April 6th 2014: Acclaimed U.S Choral Conductor Dr. Doreen Rao led 400 children and young children from across Ireland in the inaugural Big Sing held on Sunday April 6th in the Mansion House, Dublin. 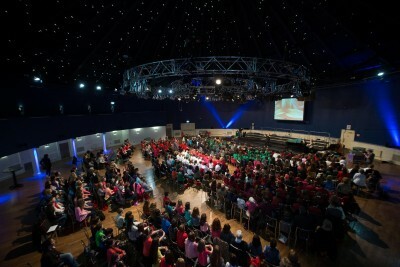 Over 52 young people from Wicklow took part in the event, organised by Music Generation – the U2 and Ireland Funds’ supported national music education programme. This was the first time that Music Generation participants from across Ireland performed together on a national stage and marks the culmination of the Choral Music Education Programme, run in association with Association of Irish Choirs and the Choral Music Experience Institute. Dr. Doreen Rao is the Director of the US Institute for Choral Teacher Education and is credited with revolutionising the landscape in conducting and music education in North America. Her interactive conducting and music education methods are inspired by diversity, a healing practice rooted in ancient cultures and a mindfulness practice. In advance of today’s event Dr. Rao has been travelling across Ireland delivering choral workshops to Music Generation students. This included a visit to St Mary’s National School, Coolfancy, Tinahely on the 2nd of April. Speaking at the event Dr. Rao said “Today, being surrounded by all these wonderful young people who have put so much energy and enthusiasm into the songs they sing, has been a truly inspirational experience. The sense of happiness and joy in this room is tangible and I was truly honoured to lead today’s performance. The hugely successful and innovative Choral Music Education Programme that has been running since September, has brought together some forty choral conductors, choir leaders and music teachers to study with Dr. Rao and an expert faculty and is supporting singing and choral projects throughout the country. Music Generation National Director Rosaleen Molloy said “The Big Sing is the very first time that we have been able to bring so many young people involved in Music Generation together to perform and we are very lucky to have had Dr. Doreen Rao here lead us on this momentous occasion. 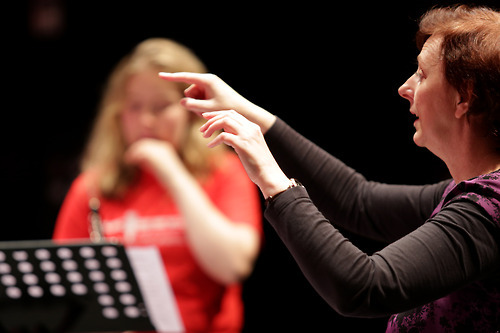 Her methodology has inspired much of the Music Generation ethos, she is an exceptional choral conductor and an inspirational music educator whose approach has transformed music education in North America. On Thursday 24th May Music Generation Wicklow was formally launched at Clermont Campus in Rathnew. Music Generation is an exciting new education initiative for County Wicklow, running low cost music education programmes for children and young people throughout the County. 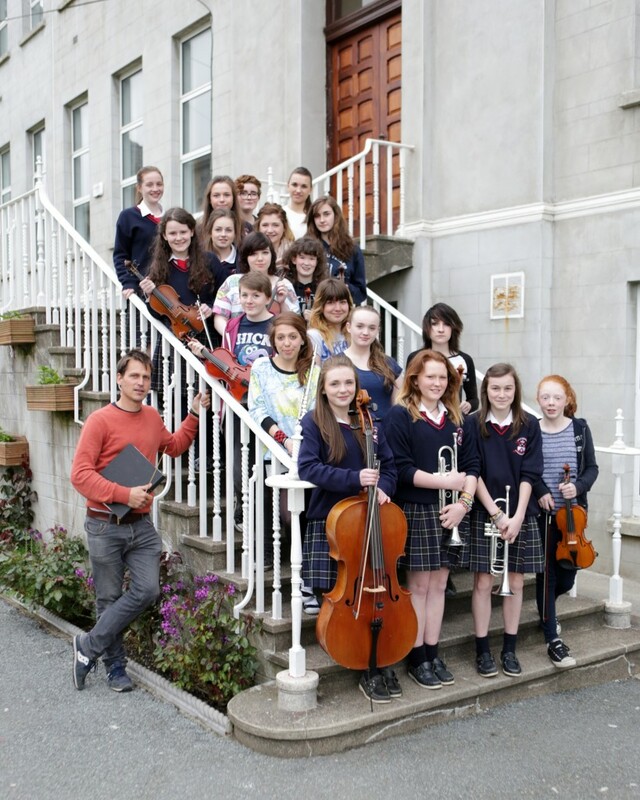 At the event Music Generation Wicklow launched their Summer Schools Program in Rock, Traditional and Classical Music. 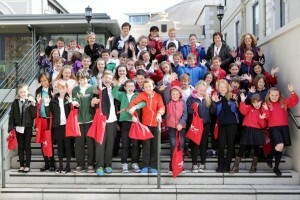 In addition applications for primary schools to avail of year-long choral, instrumental and foundation music programs commencing in September 2012 were launched.